With its entire storyline set in eighteenth century Scotland, “Castle Leoch” is more representative of the typical sound of Outlander than the first episode, which spent a fair amount of time establishing characters in the 1940’s. 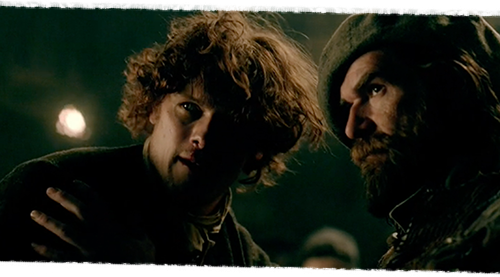 In this episode, we get to know our Scottish characters, including Jamie, Mrs. Fitz and the rest of the MacKenzie clan, especially the Laird, Colum and his brother Dougal. In my blog last week, I discussed how I incorporated Scottish instruments and folk music into the orchestral texture. For this week’s episode, I brought those influences to the forefront, striving to make the MacKenzie’s world as authentic as possible. This scene is all about Claire becoming emotionally intimate with Jamie, with anyone for that matter, for the first time since traveling through time. Heavy-handed music here could alienate the audience for the entire story arc, so Ron and I knew that the music needed to tread very lightly. Their relationship has a long way to build, so I knew finding a subtle tone for their first intimate conversation was essential for their longer musical arc to work. This is the first undeniably romantic usage of this theme, but again I was extra careful to be restrained. An instant later, Claire comes to her senses and pulls back, so the score did not have a long time to build. However, to dissipate too early would not serve the dramatic needs of the scene. My hope is that the music sticks around just long enough for viewers to fall into the emotion of the moment, and feathers out quickly, yet gracefully when Claire steps away. Gone for now, this theme will make several more appearances throughout the episode. The theme really represents the positive aspects of highland life at Castle Leoch, but for now, it belongs to Mrs. Fitz, so I’ll name it after her. Heralded by a bouncing ostinato in viola da gamba and accordion, her theme is played by a Scottish fiddle. I would never have guessed that a simple scene like this would result in one of my personal favorite cues in the entire season, but somehow it did. Her tune is jaunty and lyrical, personal and slightly intimidating all at once. The viola da gamba is a new instrument for Outlander. Readers of my blog know that I’ve written extensively for the instrument in Da Vinci’s Demons, also on STARZ, and for that reason I was nervous about including it. The instrument had a long history throughout Europe, and is as accurate for 1470’s Florence as it is for 1740’s Scotland. Performance practice evolved greatly in those intervening centuries. In Da Vinci, I worked closed with virtuoso musician Malachai Bandy to write in a style that evoked the Renaissance: simple, short phrases with minimal ornamentation and vibrato. 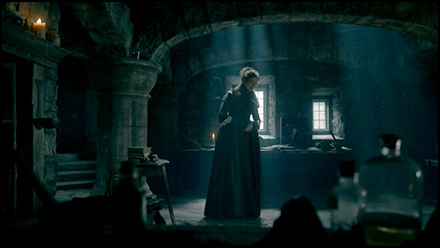 Outlander takes place at a time when music had taken on much more ornate qualities. Here, the viola da gamba was free to draw upon the elegant flourishes and fast ornaments typical of the late Baroque period. These techniques vary the sound of the instrument so wildly that casual viewers would likely never notice that the instrument featured in the Da Vinci’s Demons Main Title had snuck into Outlander. Where the Mrs. Fitz Theme is flowery and rambunctious, the Colum Theme is cold and stoic, built from rudimentary stacked fourths and played without ornamentation. I wanted to represent his limited physical mobility in his theme, so the phrases are predictable and simple. However, the ascending contour of his theme implies strength in leadership. The usage of the viola da gamba for his theme is important, because it is not a folky instrument, it’s a more upper-class sound for this time period. I wanted Colum’s world to sound different than the reedy textures of the bagpipes, accordion and fiddle we hear out on the streets of the village. 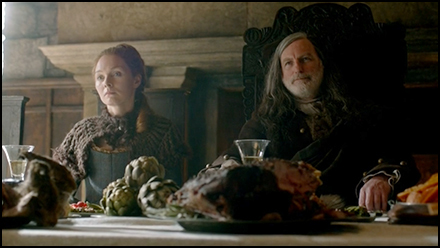 I represent Colum’s world later in the episode when Claire enters the dining hall and approaches his table. Here, a Celtic harp and dulcimer offer a delicate backdrop to a viola da gamba solo, playing “Bonny Katherine Ogie,” a Scottish folk tune. The melody itself is relatively well-known, but I gave it a distinctly regal feeling, so it almost functions like source music playing in the hall. This moment epitomizes my approach Colum: a Scottish Laird, man of the people, but one who stands apart from everyone else. He demands respect. Since “Bonny Katherine Ogie” seemed to represent Colum’s court well, I brought it back once again during the montage when townsfolk bring him their problems. The viola da gamba represented Colum, and I added a Small Scottish bagpipes, bodhrán and strumming acoustic guitars to represent his lively citizens. As I mentioned in my previous blog, I always intended to use recognizable Scottish folk music in the score to help make the world more real. 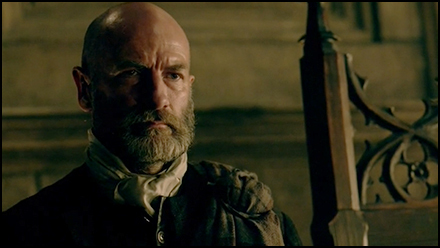 There was no better opportunity to do this than the scene when Claire first leaves Colum’s chamber and sees Dougal playing with children in the village below. 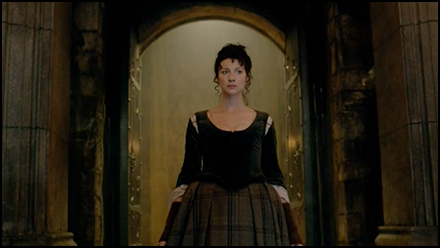 This scene is important because it is the first where Claire recognizes that this world has its charms, that the separation in time did not mean a separation in basic human values. The scene is emotional, but not sentimental. To maximize the impact, I arranged a moving version of one Scotland’s most famous ballads, “Loch Lomond.” The arrangement starts with a solo accordion stating the melody, before the Uilleann bagpipes, guitars and orchestral strings enter to repeat it once more. I found this combination of images and melody very moving, and I hope it had a similar impact for the audience. 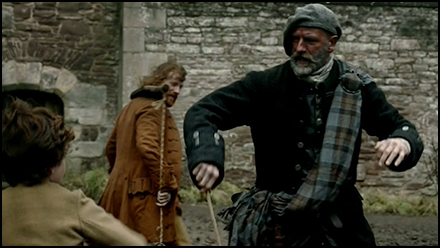 The most tense scene in the episode comes when Jamie volunteers to take a beating to spare Laoghaire. The true tension comes not from the physical violence, but the growing realization that Dougal is ordering the punishment to be extra brutal. This passage begins with bodhrán, playing an ominous, martial beat: deep, thunderous and distant, almost as if someone in the room is playing it. The tension heats up when the bagpipes enter. As I mentioned last week, each bagpipe is constructed with its own harmonic limitations. The instruments are modal in nature, meaning they are only constructed to play in certain scales. The Uilleann pipes can bend most notes relatively easily, giving them more harmonic possibilities. The Small Scottish pipes can have certain notes changed by a half-step, but the process is painstaking, involving taping down certain parts of the instrument. The Great Highland pipes… forget about it. You get what you get. These harmonic limitations are part of what makes the instruments sound the way they do, but for a composer they could be limiting unless approached carefully. For this scene, I combined two bagpipes and took advantage of their unique scales to create a clashing, two-voice contrapuntal figure. The Small Scottish Pipes enter first, with the drone playing the signature low A. The instrument’s C# had been taped down to a C natural to create an A minor tonality. Then, the Uilleann pipes enter, with their F#s pulled down to F naturals. For this bagpipe duo, I composed two lines that weave between one another like slithering snakes. The more violent the scene becomes, the closer the intervals between the pipes. Normally, I might have used orchestral strings to create a dissonant texture here, but instead, I used the strings for a gentle emotional ostinato that built up underneath the clashing bagpipes, underlining Claire’s growing concern. Finally, as Jamie spits blood and staggers, the two bagpipes clash against one another in dissonant minor seconds. When this happens, the difference in tuning between the two sets of pipes created its own violent beat pattern in the sound, drilling into our ears. The sound was like nails on a chalkboard, and yet, when skillfully mixed into the scene, subversive and subtle. 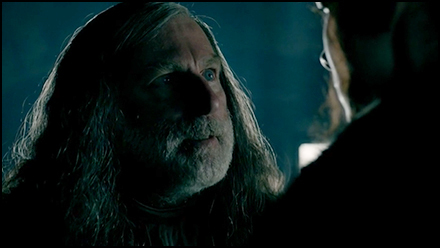 The episode concludes on a dark note, as Colum makes clear to Claire she will not be leaving the castle. When Claire realizes she is trapped in the very room where she would make love to Frank in two-hundred years, the score is reduced to a final note in the orchestral strings and a dying ostinato in the Celtic harp, making subtle reference to the Stones Theme. As with every episode, I composed a new End Credits piece that allows us to savor the mood of the final scene. Here, I wanted to represent both Claire’s present and her future. Melancholy string chords ebb and flow, underscoring her sadness. Between the phrases, a deep penny whistle offers a version of the Claire and Jamie Theme. The solo instrument underscores her isolation, while I hope that the uplifting harmonic progression towards the end of her theme offers some hope for her future. 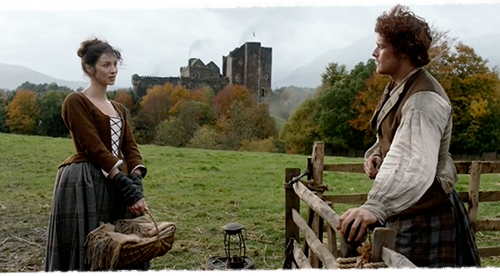 “Castle Leoch” is an important episode for me, because it gave me the opportunity to really dive into the Scottish instrumentation and folk music and figure out how to use them to propel the narrative forward. I introduced a new instrument, the viola da gamba, a new theme for Colum and used new folk tunes to help establish the world. There is, however, one striking difference between the music of the first episode and the music of the second that I did not mention. Anyone catch it?